In case a UV filter or uvc filter is applied, the pond water is pumped and passed additionally along a lamp, which radiates ultraviolet light. This light will kill many harmful organisms, like algae for example. Algae and different organisms make a green mess of your pond. Especially if you have a pond containing many fish. A UV filter is ideal to keep not only your fish pond, but also swimming ponds and mirror ponds lastingly clean and clear. How does a UV filter work? A UV-filter is in fact no filter but an addition to existing filter techniques. Pond water is passed along an ultraviolet lamp. As a result of this the water is sterilised, which causes algae, germs and moulds to be killed. In particular floating algae. This occurs during a very short contact time. This implies that the flow speed of the water may be high. 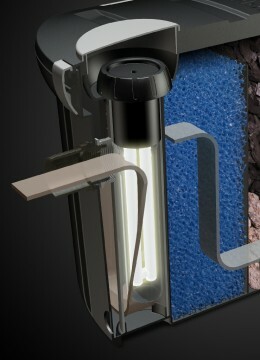 The lamp, the UV-C unit, is in the initial filter phase. In the second filter phase the right bacteria which were killed too, will be replaced by fresh ones which will be added again . A UV-lamp should be present when starting up a pond. Once there are floating algae on a large scale in a pond, a UV-C filter will not be able to remove them quickly. You arte advised to let the UV-filter on constantly from the beginning of April till the end of October. A UV-C unit should always be used in combination with a different filter. You should also pay attention to the fact whether a UV-C unit has a circuit breaker. Thus you will prevent any contact with its harmful radiation. For optimum functioning it is important that you replace the UV-C lamp annually. This will guarantee that you have a clear pond during the whole pond season. Also pay attention to the power of the UV-C lamp. Rule of thumb for application of a UV-filter is 2 to 3 Watt per 1,000 litres of pond water.